I love barbecuing. As a matter of fact all three of us just love the great charcoal grilled taste of the steaks and chicken. In Germany a potato salad always accompanies the barbecued meats. 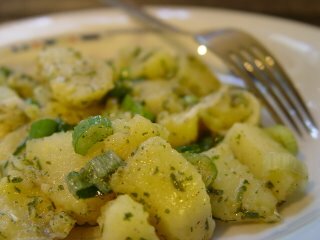 I am not always such a big fan of the traditional potato salad, with mayonnaise and other real heavy ingredients. I was rather happy when I found this recipe a few months back on the internet. So, when we decided to open the 2006 barbecue season I was eager to try this out. This was accompanied with my favorite Italian oven vegetables. 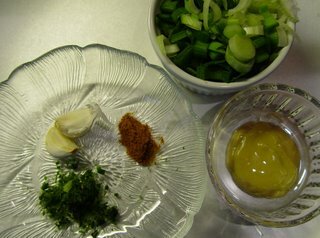 In a large bowl mix together the herbs, garlic, lemon vinegar, paprika powder and mustard. Mix well. Add the olive oil and whisk thoroughly. Cut the potatoes in cubes and gently toss in the dressing mixture. Salt and pepper to taste and mix once again. I am the type of person that buys/cooks for far too many people. My portions tend to be bigger than usual and it has taken me a long time to learn to cook accordingly. Coming from an Indian family where food always played an important role, the meals with family and friends where some of the happiest moments in my life. My mum was always very happy and proud when nothing was left-over! Well, measured in this fashion I will say there was no end to my happiness. I did buy far to much and I did cook far too much. Considering we were only 4 at the dinner table and one was a child of 3 1/2, it pleased me that every little bite was devoured. Our guest was also German and he praised the potato salad. When he said it tasted better than anything else he had eaten, it really made me beam. The empty bowl was proof enough! I must try out this one, Meeta. I,too, find the traditional Kartoffelsalat too heavy and my stomach sometimes practically refuses to digest it. The last time I had it was during Karneval and I suffered a bad tummy for almost three days. Don't want to have it till I can now.